Just a few miles south of Hartwell, Georgia there is an historical marker and stone monument that declare that this spot is the “Center of the World.” When you see the marker and note the rural surroundings you wonder how that designation came to be. The Cherokees inhabited the mountainous region of the South long before the arrival of Europeans. Historical and archeological evidence shows that the Cherokees settled in this area many generations before the Spanish arrived in the sixteenth century. Gold was discovered in the territory in 1829 and the next year Congress passed the Indian Removal Act. On the basis of that congressional action President Andrew Jackson was authorized to negotiate treaties with Native American tribes. The leaders of the Cherokee Nation were divided on what response they should give to the efforts to separate them from their land. Some believed either warfare or negotiation with the U.S. government was the answer but others favored removal in exchange for financial compensation. The latter group signed the Treaty of New Echota although some say it was not legal. This “illegal” treaty was then signed by President Andrew Jackson and it passed by one vote in the U.S. Senate. The opposing faction opposed implementation of the treaty and were forcibly removed by the military. Thousands of Cherokees died on the westward migration during the winter of 1838-1839 on what is commonly known as the Trail of Tears. The descendants of those who were removed became known as the Cherokee Nation of Oklahoma. A smaller number of Cherokees avoided forced removal and remained in the mountains of North Carolina. They became the Eastern Band of Cherokee Indians. Thus the historical marker in northeast Georgia is the sole reminder of dramatic changes that occurred 175 years ago. 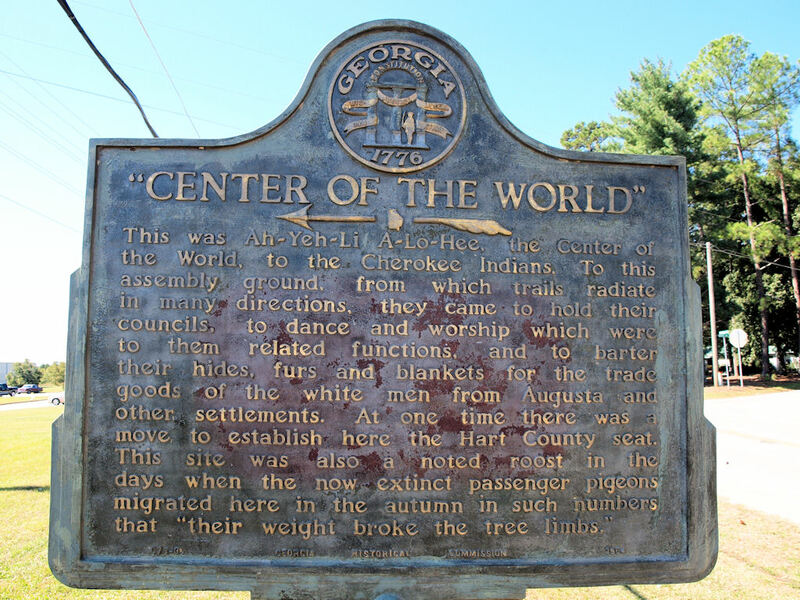 The “center of the world” for the Cherokees shifted in ways they could have never imagined. This is a reminder that nothing is permanent. One thing that you can count on is change. God cares equally for all of us. While at any given moment we might think that all the world centers on us, we must not deceive ourselves to think that we are the most important and that our privileged position must be maintained. We must also be careful not to destroy others’ “center of the world” for our own gain. The hymn writer had it right: This is my Father’s world. O let me ne’er forget that though the wrong seems oft so strong, God is the Ruler yet. Corinth is a city located in southern Greece about 50 miles from Athens. About two miles from the city a narrow isthmus forms a land bridge between the main landmass of Greece and the Peloponnesus. The isthmus is less than four miles wide and separates the Peloponnesian peninsular from the Greek mainland. Ancient Corinth controlled the two major harbors and thus command of the trade routes between Asia and Rome. In those days small ships were often dragged across the isthmus on a paved road. Larger ships unloaded their cargo, which was then carried across the isthmus and then reloaded onto other ships. Alexander the Great, Julius Caesar, and Caligula all considered making a canal through the isthmus. In 67 A.D. Nero came to Corinth for a groundbreaking ceremony for a canal to be dug by Jewish prisoners, but the project was abandoned. It was not until 1881 that work was begun on the Corinth Canal and French engineers completed the project in 1893. Today the Corinth Canal, 4 miles in length, cuts through the narrow Isthmus of Corinth and connects the Gulf of Corinth with the Saronic Gulf in the Aegean Sea. Earth cliffs flanking either side of the canal are over 200 feet high. Before the canal was built, ships sailing between the Aegean and Adriatic had to circumnavigate the Peloponnese adding about 185 nautical miles to their journey. It saved sea-going vessels immense amounts of time as it provided a much shorter nautical route to the west from Athens. An idea that lingered almost two centuries brought welcomed relief to sea going vessels. Upon completion of the canal ships no longer had to off load their cargo and have it transported over land to the other port. That was wonderful news in the 19th century. However, the fact that the canal is only 70 feet wide at its base, makes it unusable to most modern ships. Only modest sized cruise ships and other smaller vessels use the canal nowadays. The story of the Corinth Canal illustrates at least two things. It reminds us that great things sometime need time before they can be realized. It is easy to give up on an idea when obstacles prevent implementation. To get discouraged and decide it is either impossible or not worth the effort. Secondly, this story is also a reminder that life is a continuum and what works at one time might not be practical at another. Sometimes ideas become obsolete or need revision. In either case we should not be discouraged from dreaming, planning, and doing. God is constantly creating and allowing us to share in the creative activity. I heard an outstanding sermon last Sunday at the Peachtree Road United Methodist Church in Atlanta. Dr. Bill Britt is an excellent preacher and this was one of his best. His topic was “A Church With Open Doors” and he emphasized the need to show hospitality and welcome strangers. Dr. Britt repeated a story that he heard from Dr. Fred Craddock about an experience in the early days of his ministry in rural East Tennessee. The atomic energy facility, later called the Oak Ridge National Laboratory, was being built in Oak Ridge. People working on the project were moving into the area and the landscape was changing. Dr. Craddock was the pastor of a small church in Oak Ridge at that time. He suggested that the church needed to reach out to the new folks, many of whom were living in temporary housing on the hillsides of the community. The response to that suggestion was that those people were there only temporarily and they “wouldn’t fit in” with the members of that congregation. That sad story brought to mind a personal experience from my childhood. When I was eight years old my family moved from a rural community in south Alabama to the city. We lived just a few blocks from the heart of downtown Mobile. My parents were uneducated working class people. It is certainly accurate to say we were not affluent. The St. Frances Methodist Church sat on the corner of St. Frances and Joachim streets. It was a church of prominence and influence in the city. As I grew into my teens I walked past that church frequently on my way to and from my home just north of that intersection. On some evenings I would see boys running around and having a good time. That was my first and only time to attend a Boy Scout meeting until I was an adult. I learned that the Boy Scouts was an exceptional organization and that scouting was one of the outstanding programs making a positive impact in the lives of boys and young men. I have often wondered what difference it would have made if that scout master had welcomed me and Steven instead of rejecting us. The irony of my story is that I have been an ordained minister for over 42 years in the same denomination as the church that sponsored that scout troop. Throughout most of my adult life I have been a strong supporter of the Boy Scouts. St. Frances Methodist Church no longer exists. And the church in Oak Ridge is now a barbeque restaurant.